Centralia | For the second time in two weeks, an historic Southern Baptist church building in Marion County was damaged by fire. 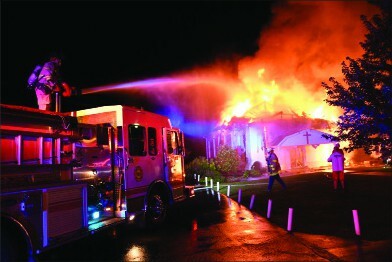 On July 15, the sanctuary of Zion Hill Baptist Church in Centralia was destroyed in a fire caused by a lightning strike. The building, which dates back to 1863, was one of the oldest standing churches in the county, the Southern Illinoisan reported. The blaze was the second church fire in Kaskaskia Baptist Association this summer. Earlier in July, a fire believed to be arson at Bethel Baptist in Odin did extensive damage to the building’s interior. At Zion Hill, Pastor Kyle Emery and his church are already in the rebuilding process. Volunteers gathered at the church for a work day July 21. Local businesses have supported the church by hosting a fundraiser and providing printed signage to point people to their temporary meeting space at their local Baptist association office. “We were blessed with offers from many churches and businesses in town, but we made the decision to meet in the Kaskaskia Baptist Association office,” Emery said. Zion Hill is meeting at the office for worship services and business meetings, and Director of Missions Mike Hall invited Emery to set up a temporary office there too, the pastor said. Emery told the Illinois Baptist that once demolition is completed on the damaged building, renovation can begin inside the adjacent fellowship hall building, which suffered smoke and water damage. The goal, Emery said, is to be meeting onsite again in six weeks. Zion Hill marks its 158th anniversary this year.